1. Player collects footballs to gain points. This also spawns enemies. 2. When a player is caught, the meter goes down until they lose. 3. If the player get caught, they can get free by tapping the screen rapidly. 4. The player can collect a spinning shield coin to turn enemies into collectable footballs for a few seconds. 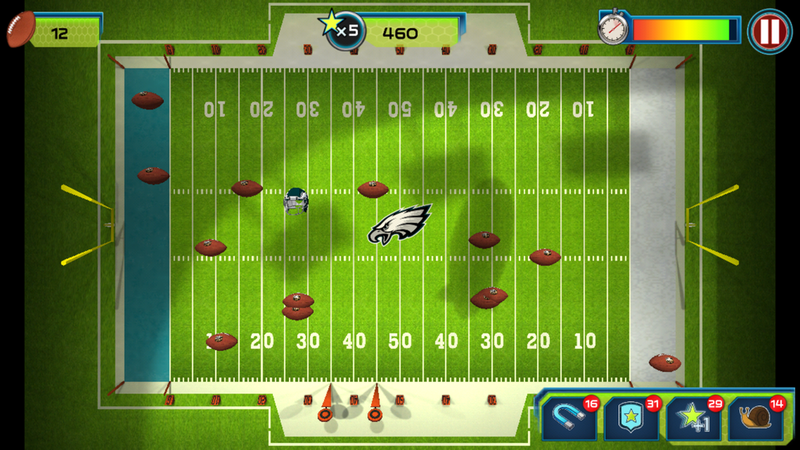 Tackle Trouble is a minigame where players collect footballs to gain points and increase their point multiplier. For every football they collect, a new enemy spawns which moves at random. The fifth football collected, as the time of me writing this, spawns a special enemy which chases the player. When the player collects a NFL Shield coin, the enemies turn into collectable footballs. They can then collect them to clear the field of enemies. However, after a few seconds uncollected enemies will flash and change back into enemies. When a player gets tackled, they are prompted to tap rapidly to escape the tackle. While the player is tackled, the timer at the top right corner of the screen begins to go down. If it reaches zero the game is over. Role: Game Designer, Scripter, UI Designer. Tackle Trouble was one of two games which I was handed with the instructions of "It's not that fun. Make it fun." I believe I did exactly that. The first issue I had to figure out was how to deal with the enemies overwhelming the player. I added in a NFL Shield Coin as a collectable to remedy this. The player could collect this coin to temporarily turn the enemies into footballs. This allowed the player to collect them for additional points and clear off the field. The coin initially spawned after five to eight footballs were collected. After the coin was collected, the player would have to collect one more than the previous amount for it to appear again. This made the game not too easy and allowed for ramping. The next step was to add some enemy variety. Enemies who move around randomly and just bounce off the walls don't make for difficult obstacles. I added in enemies which seek the player to make sure the player had to keep moving. This kept the player engaged and from getting bored, leaving their character hiding in the corner. Over time, these enemies, as well as the random moving enemies, would speed up. This also increased the pressure on the player and kept them from ignoring shield coins for too long. If a player kept from getting tackled, their score would be multiplied. The first football would be worth ten points, the next twenty, then thirty, and so on, all the way up to eighty. This reinforced the players' need to keep collecting footballs and avoiding enemies further. The getting tackled mechanic was brought about due to the game still being too difficult. Originally, if the player was touched by any enemy, the game ended. I added in a health bar in the top right corner of the UI. When a player was tackled by an enemy, they would begin to lose health slowly. This was not particularly threatening unless the player was tackled by multiple enemies, because each enemy added on to the amount of damage a player was taking per second. If one enemy was on them, they would be taking ten damage. If there were eight on them they would be taking eighty damage per second. I allowed players to escape through tapping the screen quickly. I set each tap to a specific value, and weighed it against the number of enemies on the player. This allowed the player to break free, temporarily stunning the enemies. These mechanics came together to create one of the strongest mini-games in the NFL RUSH Heroes & Rivals, or so I was told by the NFL executive who refused to put it down after we presented it to her. Disclaimer: Art done by artists at JumpStart - Knowledge Adventure.